How do retail managers determine the best possible candidate for a leadership role? How do they build growth plans to develop the leadership skills of existing employees? Many go with their gut, which sometimes works well for those with strong experience and intuition, but relying on this method can also backfire spectacularly. In The Retail Leadership Profile, veteran retail manager Jon Dario offers an alternative to gut-based guesswork. His leadership profile succinctly identifies the thirteen character traits that make the ideal retail leader. Under Dario’s expert guidance, you’ll discover how to use the leadership profile to assess qualified candidates during the interview process and how to cultivate and develop beneficial growth plans for employees to prepare them for retail leadership roles. Dario’s leadership profile also holds the key to furthering your own retail management career, providing a plan for career development, and building your own personal brand. 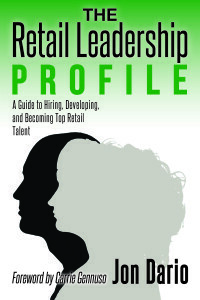 Always helpful and suffused with humor, The Retail Leadership Profile contains powerful tools and processes to nurture leadership skills in yourself and others. Dario’s guide to hiring and people development is of use to retail managers at all stages of their careers, as well as to human resource managers looking to provide guidance to retail management and staff. © 2019 The Retail Management Formula | Providing tools, advice, and resources to improve the effectiveness of front line retail managers.